Why the U.S. Military Should Fear "Ramjets"
 Home  defence  Defense  Military  savunma sanayii  Security  Why the U.S. Military Should Fear "Ramjets"
Ramjets have made somewhat of a comeback in military technology recently. While ramjets powered many anti-air missiles throughout the Cold War, more recent designs eschewed them in favor of multi-stage rocket boosters or simply more powerful rockets. Ramjets have made somewhat of a comeback in military technology recently. While ramjets powered many anti-air missiles throughout the Cold War, more recent designs eschewed them in favor of multi-stage rocket boosters or simply more powerful rockets. However, a new crop of ramjet designs, mostly revolving around solid fuel ramjet technology have put the ramjet back on the map. Ramjets were first developed for use on missiles in the late 1940s as a technology to allow missiles to sustain supersonic speeds for long durations. Traditional jet engines were still subsonic at the time, and rockets could not propel large payloads fast enough. The first prototype ramjets were simply fuel sprayers placed in a tube with a flare used to ignite the fuel. HVAR rockets were used to accelerate these tubes up to supersonic velocities. Tests of these primitive ramjets in 1945 were successful and showed further potential for the design. Some difficulties were encountered with prototype rockets tearing themselves apart under acceleration and with the perfecting the fuel to air mixture ratio, but these were solved by 1949 with the eXperimental Prototype Missile (XPM), which demonstrated that a ramjet powered missile was viable. The XPM incorporated key aerodynamic innovations that would come to define later ramjets. At supersonic speeds, the air coming in would often be going too fast, so the air was compressed then released into an expansion chamber to slow it down to subsonic velocities. It was then mixed with fuel and ignited in a combustion chamber, creating pressure. This pressure causes the combustion products to exit the engine at a higher velocity than the surrounding air, causing thrust. Integration of the ramjet technology into an actual missile occurred within the Talos program, which aimed to provide U.S. Navy ships with a long range (out to fifty miles) anti-air missile. 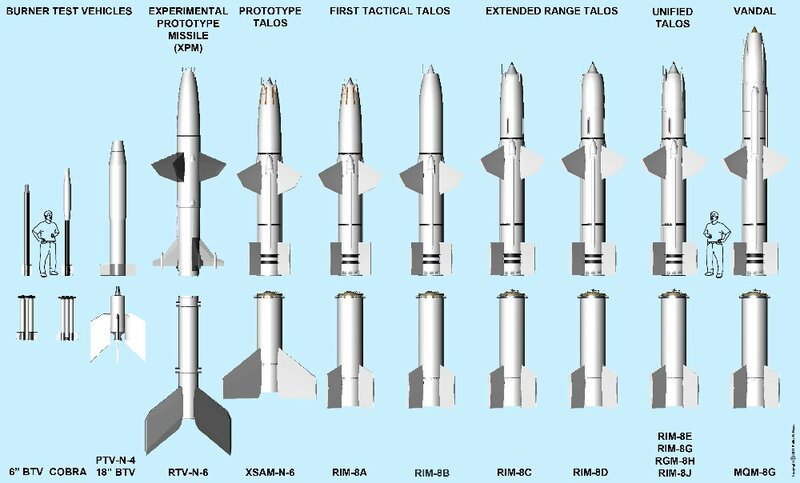 The first Talos was an evolution of the XPM, incorporating a rocket booster into the back to accelerate the missile to requisite speed before igniting the ramjet and integrating radar homing mechanism and warhead. It reached service in 1952. The ramjet nature of the missile meant that a simple seeker-warhead-engine layout could not be used for in the RIM-8 Talos. Because the entire missile was an engine of sorts, the designers had to be crafty in where they placed the missile components. Instead of a singular antenna in the nose, four antennas used to receive the radar homing signal were placed around the intake. The warhead was placed inside the innerbody that was used to compress air in the intake of the missile. All guidance electronics were placed around the channel through which air flowed through the missile. The RIM-8 was a successful design, scoring the Navy’s first surface-to-air missile kill in 1968 on a North Vietnamese MiG-21. It was also adapted into a long range antiradar missile to strike NVA radar sites. But America was not the only one using ramjets in this role. The Soviets also implemented ramjets in the 2K11 “Krug” (SA-4) and 2K12 “Kub” (SA-6) missiles. Unlike American missiles which had a singular booster behind, the 2K11 featured four rocket boosters on each side of the missile in order to get it up to speed. The 2K12, on the other hand, used an odd partial inversion of this design, with four ramjet air intakes on all sides of the missile and a central booster. However, as rocket technology advanced, ramjets began to look less and less attractive. The rocket-powered RIM-66 Standard Missile would come to replace the RIM-8, and the 9K37 Buk would do the same for the 2K12 Kub. While the ramjet went out of fashion for surface-to-air missile designs in the late 1970s, the Soviets began looking into them to make their anti-ship missiles faster at the same time. This resulted in the P-270 Moskit and P-800 Onyks. The Indian/Russian BrahMos missile is also ramjet powered. While the West is more focused on subsonic anti-ship missiles, the use of ramjet technology by Russia in the anti-ship role is likely to continue as their doctrine emphasizes speed. But recently the west has been interested in ramjets again. While they are unlike to return in the surface-to-air role, ramjets are now being employed in the air-to-air role by missiles such as the MBDA Meteor. While most air-to-air missiles continually lose energy after their boost phases, ramjet powered missiles retain energy a lot better due to the continual thrust provided by the ramjet engine. This makes them harder to evade, as the missile has more energy in the final intercept stage. This was a known feature of some ramjet powered surface-to-air missiles like the British Sea Dart, and one of the reasons why it proved so deadly against Argentine aircraft in the Falklands War. Artillery shells are another application where the continual thrust of a ramjet engine is a desirable feature. Unlike current rocket-assisted projectile shells, which suffer from the same drawbacks of only being able to provide thrust for a relatively small time, ramjet shells can provide a “boost” for much longer. The integration of ramjets onto air-to-air missiles and artillery shells was made possible by the miniaturization of ramjet technology. First gen missile ramjets such as those featured on the RIM-8, 2K12, 2K11, and Sea Dart all relied on liquid fuel in their ramjets, so they had to be very very large. The new ramjets use solid fuel instead, allowing them to be more compact. They also have a limited “throttling” capability, allowing the missile to control the rate at which it uses fuel.